Rediff.com » Movies » Will these South stars make a splash in Bollywood? Being one of the largest producers and consumers of movies in the world means an enormous number of actors and actresses, all talented and beautiful in one way or another. But the Indian movie industry, broadly divided into North and South, has had movies and star casts functioning independently, complete with brand names and fan-followings that hardly overlap. Still, a few actors and actresses have migrated from one side to another, sometimes creating ripples, at others a mighty splash. While Northern heroines have made their way down south all the time, Southern stars (mainly male) making it big in the North has been a somewhat rare phenomenon. Today though, the scenario has changed. With technology and wider exposure bringing all sort of cinema to everyone's doorstep, its only natural that language barriers cease and stars mingle as well, blurring the industry-divide. Here are a few stars who've seen success on their home turf and are taking their glory to Mumbai, to conquer new hearts. A petite beauty who's part Italian, part Maharashtrian and part Burmese, Chennai-girl Lekha started life in the industry as a qualified film-maker from NID Ahmedabad and did some work in theatre. Later, she became a VJ with SS Music leading to a fairly successful stint. Her break in the movies arrived in the form of R Kannan's Tamil venture, Jayamkondaan, where she played the resilient, stubborn sister to Vinay Rai's brother, and earned accolades for her realistic portrayal. Her fame rose when she was chosen to present the first IPL matches. She's signed a few projects in other Southern languages but her break in Hindi arrived in the form of UTV Spotboy's Peter Gaya Kaam Se, as a bikini-clad girl in Goa, with Rajeev Khandelwal -- reportedly a swift-paced flick. Very few could have predicted the star value of Tamil's boy-next-door who steadily vowed audiences with his acting talent. Whether it was the delicately made Ghajini, the sensitively crafted, delightful Pithamagan or the enormously entertaining Ayan, it was obvious that this man had acting in his blood, is willing to experiment and could draw audiences at will. No surprise, therefore, that he was drafted in by maverick film-maker Ram Gopal Varma to play Maddelacheruvu Suri for the trilingual Raktha Charitra, a tale of murder, violence and bloodshed realistically conceived. He's admitted that his Hindi needs work but his acting is on par with whatever is required and more, say the makers and co-stars such as Vivek Oberoi. 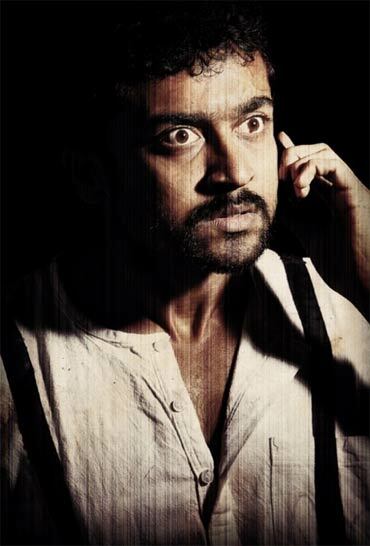 Suriya's Bollywood debut is looked upon with much eagerness. Post the stupendous success of Asin in Aamir's Ghajini, news flew around that another Southern heroine was about to break into Hindi. Sensuous and slim Trisha, belle of the Tamil and Telugu industries has set the screen on fire for quite a few years now, and it was only natural that she cross over to Hindi as well. Following Vinnai Thaandi Varuvaya, the critical and commercial hit, Trisha is busy wrapping up Khatta Meetta, starring Akshay Kumar and under the aegis of the director who gave her first film, Leysa Leysa -- Priyadarshan. Her co-stars firmly opine that this golden girl from Kodambakkam will go places, she's signed on a three film contract with Akshay. The scion of a famed film family almost always follows in his family's footsteps -- and that was the case with Ramanaidu Daggubati -- nicknamed Rana, nephew to Telugu stars Nagarjuna and Victory Venkatesh. Rana, however, proved he was a chip off the old block with the success of Sekhar Kammula's Leader, the tale of an unwilling entrepreneur who steps into politics. Even during the making of Leader, Rana was noticed by film-maker Rohan Sippy, who promptly cast him in his next ambitious project: Dum Maro Dum. Dev Anand's fuming notwithstanding, the movie's been progressing at a great pace: Rana plays a Goan guitarist and has been paired with Bipasha Basu, while sharing screen space with the likes of Abhishek Bachchan and Prateik Babbar. The movie is supposedly based on drug trafficking. Rana has been working hard on his Hindi diction and guitar skills, and the movie is looked forward to, eagerly. National award winning Tamil actor, Vikram is one of those actors who possesses a rags-to-riches story that would turn any celluloid hero green with envy. He started out a hero, but an indifferent response from the public brought him nothing but small roles that did nothing to showcase his talent. Then came Director Bala's Sethu and everything changed overnight. Here's a star with convincing screen presence who, wonder of wonders, could actually act! The public went gaga as he set the screens of fire with almost consecutive hits like Dil, Dhool, Gemini, Saami and Pithamagan, even winning a National Award in the process. Then came the magical call he'd been waiting for all his life, the one that had evaded him when Bombay was being made by Mani Ratnam. The ace director cast Vikram in both versions of his latest, Raavanan in Tamil, and Ravanaa in Hindi. The surprise package was Vikram himself, playing completely opposite roles in both versions. It's not difficult to believe that his considerable histrionic talents have been put to good use; his co-stars are lavish in their praise of him. This movie is easily among the most anticipated among 2010's releases. With a name like that, you'd be forgiven for thinking that there's hardly anything South Indian about her but Neha's debut happened to be in Telugu, opposite Ram Charan Teja (son of Megastar Chiranjeevi) in Chirutha. The movie was a success, and Neha found her horizons widening, namely with an offer to star in Mohit Suri's Crook, along with Emraan Haashmi. Let's wait and see if this one launches her right to the top. Pix: Meet the newcomers who rock LSD!